Adam Lefkoff still remembers as a child going with his father, an attorney, to visit a client at home. "He had three pinball machines in his house," Adam said. "And that - as a 5-year-old living in Atlanta - that just blew my mind. 'Oh my goodness, you can have pinball machines in your house?'" The Longmont computer programmer always said someday he'd have pinball machines in his house. Now, he owns about 30. They're even separated out into specific rooms based on style. Classic pinball machines from the 1970s in one room. Bally-Williams machines – most based off movies and TV shows such as The Addams Family and Dirty Harry – in another. In a third, you'll find the more high-tech toys that look like a cross between a video game and a pinball machine. It’s clear Adam loves the machines and the game. He's also passed on the pinball bug to his son Escher, 12. "I have been playing pinball since I was 2 years old," Escher said. "We actually have old stools that I used to help me reach the flippers." Even before that, Escher was around the games, hanging in a Baby Bjorn on Adam while he played. "He was a bit of a drooler as a baby, and so all of our pinball machines had this just caked-on drool from Escher," Adam said. The younger Lefkoff is ranked number 1 in the world among youth players, according to the International Flipper Pinball Association. Overall – for the moment - he's 143rd in the world; a ranking and reputation that he's been building since he first began competing at the age of 3. The elder Lefkoff is currently ranked 43rd in the world. The Lefkoff's machines don't need quarters. They're all set on free play. 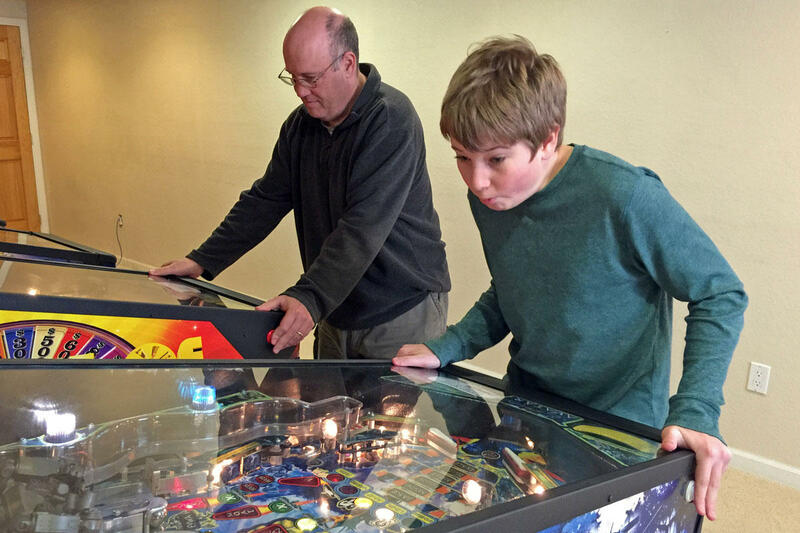 Father and son are hoping to climb higher in the world rankings during both the Professional and Amateur Pinball Association World Championships and the International Flipper Pinball Association World Tournament. At each, pinballers from around the globe will gather in Carnegie, Pennsylvania to duke it out to see who has what it takes. 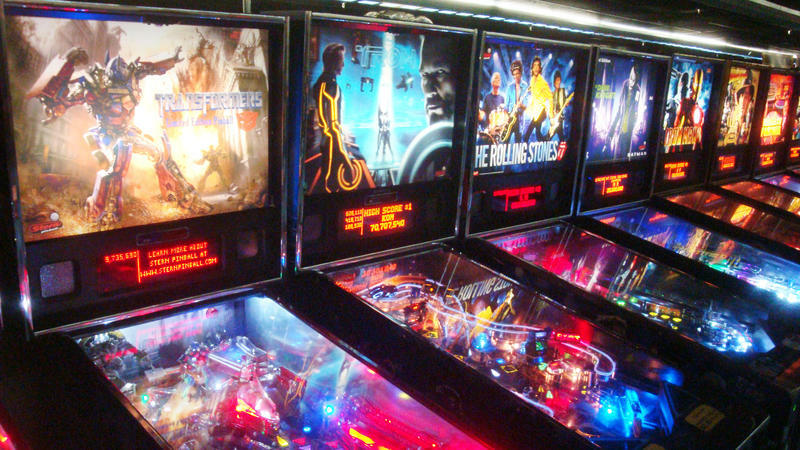 "Pinball machines have wizard modes, is what they call them," Adam explained. "Which is when you finish enough things you get to – it's sort of the end of the game or a reward for getting to the end." In other words, beating every challenge the machine throws at you. For instance, on the family's Star Wars Episode I game, getting to wizard mode means the chance to do battle with the evil Darth Maul. Escher has gotten there twice. Adam has gotten to it once. "And you got destroyed," Escher teased his dad. Adam Lefkoff and his son, Escher, practice for their next pinball tournaments. Both are ranked in the top 150 players in the world. It's good natured though. Pinball is something fun that he gets to share with his dad. His mom, Sandra, and sister, Ainsley, aren't big fans. The ribbing does make you wonder, who is the better player? "I'm better than he is and it's only because of that experience," Adam said. "But so many things come natural to him, he's fearless… There is no doubt, he will be better than me when he gets older." Of course, the rankings ultimately decide who the best player is. Standing in front of his own Tommy-inspired pinball machine, Adam bristles at the mere mention of The Who's classic, "Pinball Wizard." "Imagine if football or basketball or baseball only had a single song that represented it," he said. "And you would hear that song, any time anybody had anything to say about football or baseball or basketball. It would be – it would drive you insane. Well, welcome to pinball because I think other people have tried, but there is basically a single song and a single anthem, which is 'Pinball Wizard' and it's a great song, really it is. But it gets a little old. Well actually, it gets a lot old." Before rehearsing his opening song in Loveland Opera Theatre's production of the classic Pirates of Penzance, opera singer Adam Ewing needs a little warming up. "I think the speech-like nature of it lends itself very easily to being sung and kind of stumbled over," Ewing said of his opening number, "I am the Very Model of a Modern Major-General" – more commonly known as the "Major General's Song." And it is a very commonly known song. "Something about it - it's just kind of in the public consciousness," Ewing said. When most people want to play a game, the first thing they reach for is likely a smartphone or tablet. Actual pinball machines have become quaint curiosities, but a father-son duo in California is keeping these old-school games alive in a museum. The Museum of Pinball is hidden away in an old industrial building, just off Interstate 10 and about 90 miles east of Los Angeles in Banning, Calif. It's pretty quiet when the rows upon rows of pinball machines are not turned on. But once the switch is flipped, it gets loud. In an electronic age of social media, Facebook games, summer blockbusters and other distractions what has happened to the amusements of yesterday? They're still alive in Colorado.